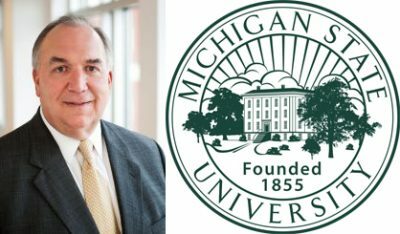 Interim Michigan State University president John Engler is resigning effective next Wednesday, January 23, at 9 a.m. In an 11-page letter to the MSU Board of Trustees, he outlines the accomplishments of his tenure but notes he will leave the office at the request of the new Democratic majority of the board. The former Michigan governor says he believes he’s leaving his alma matter in a better condition than when he took over following the resignation of Lou Anna Simon as president. She is now facing criminal charges for allegedly helping to cover up the sexual abuses of former MSU and USA Gymnastics sports doctor Larry Nassar. Engler served three terms as Michigan governor from 1991 to 2003, the last person to be able to hold the job for more than eight years due to term limits being approved while he was in office.